GUESS THE PENCILER CONTINUES! No one named the artist of the layouts I posted earlier. So we're giving you a new clue. Here's a penciled and inked page from the first issue I'll be writing of this on-going DC Comics series (one penciler, a different artist inking). Yes, I know there are no human figures on this page, to help identify the artist. That's an intentional decision on my part and I think it makes it more fun. If none of Starlin's fans guessed the artist on the previous pages, that actually does narrow the field somewhat from some seemingly-possible names. Guesses included Pasqual Ferry, Patrick Broderick, Rick Leonardi, Jesus Saiz, Georges Jeanty, Barry Kitson and Starlin himself. Starlin had previously stated that he wouldn't be drawing the book he writes. So far, Ron Lim is far and away the most popular choice among Starlin's fans for the artist behind this page. Other names mentioned include Phillipe Druillet and P. Craig Russell. 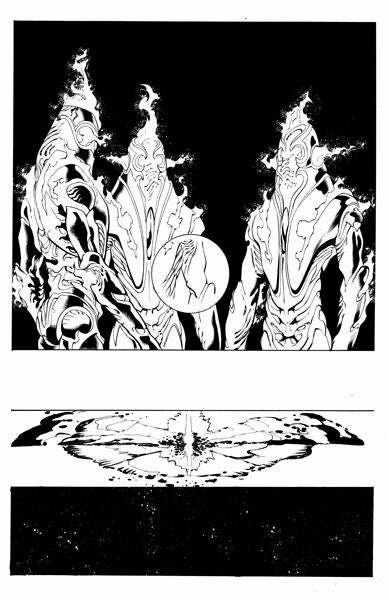 Previous pages have appeared to show Lobo, The Weird, an A.R.G.U.S. helmet and an unnamed female character. Little can be said conclusively about the comic, except that it seemed to be set in space--something that this latest page seems to confirm. As for the inhuman figures shown above, none of Starlin's fans and commenters have any guesses yet; the armor appears to have an aspect of the Anti-Monitor to it, although if memory serves, DC has said that character doesn't exist in the New 52. 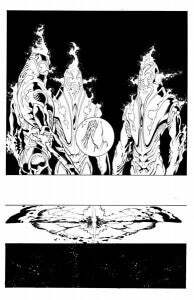 Energy-based beings that have appeared in the New 52 so far include Firestorm and Captain Atom, although neither of them seem to have anything particularly in common with these wraiths. Would you call this whole thing a Cosmic Odyssey or a Mystery in Space?